Tucked in the hills along the edge of our town's outer limits is my favorite local garden center, Navelet's. I've loved shopping at Navelet's ever since we moved here because of the highly knowledgeable staff, healthy and diverse plant selection and the overall atmosphere--the way it makes me feel to walk around and browse the aisles. Hummingbirds, butterflies and pollinators dart around the blooms. Birds chirp overhead. The air smells of moist fresh soil. For the past year or so, I go there to see if I'll have a chance to interact with Frankie. Frankie isn't an employee. Frankie is a cat. A sweet youngish tabby cat. Frankie doesn't belong to the nursery. He lives just over the garden wall in some condos that have their small patio gardens backed up against the nursery. And according to the nursery staff, Frankie has decided the whole of the garden center is his "backyard". He has full access to the entire center--inside and out. He waltzes in and out of one of several of the big sets of double doors that always remain open during business hours. 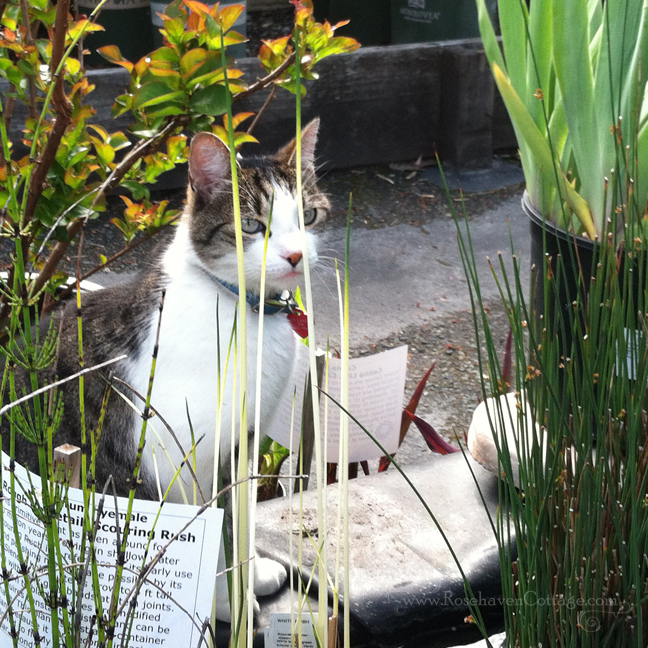 Ever since the first time I met Frankie, when I walk into the nursery I know that within the first five minutes he'll come and find me even if I'm still inside looking at the seeds or bulbs on the shelves. Tail held high as prominent as a flagpole, Frankie will come sauntering down the aisle to greet me. I always stop to rub his jowls and scratch his back. Then he will nonchalantly follow me around as I shop, taking brief detours to amuse himself or visit other shoppers. But he always comes back and follows me around until I'm ready to checkout. Then he quietly slips away to do something else on his kitty cat to-do list. On the spring day I took these photos, Frankie took an extended detour from following me to check out the water plant section. He ended up mesmerized while watching tadpoles in the water. Shortly before I shot these photos, he lapped up some water along with some frog eggs which he seemed to find rather appetizing (must be like caviar for cats). A horticulturist on the nursery staff told me that Frankie has quite a few fans. She also told me that she has a soft spot for him too and regularly posts photos of him online. He's become the garden center's mascot. I think it's adorable. I had a chance to visit with Frankie just last week when my mom and I went there to look at lantana for my container garden (I posted about it here). My mom had her tiny little senior chihuahua, Chica, with her, and we finally discovered someone Frankie doesn't like... dogs. Chica is so tiny and quiet she walked up behind Frankie and was sniffing him without Frankie being aware she was there. Then he turned and was startled to find himself face to face with this miniature canine. I guess even though she's smaller than he and doesn't really look like a dog, she still smelled like a dog. He immediately hissed and let her know she was not welcome on his turf. Chica was scooped up and carried until we were ready to go. 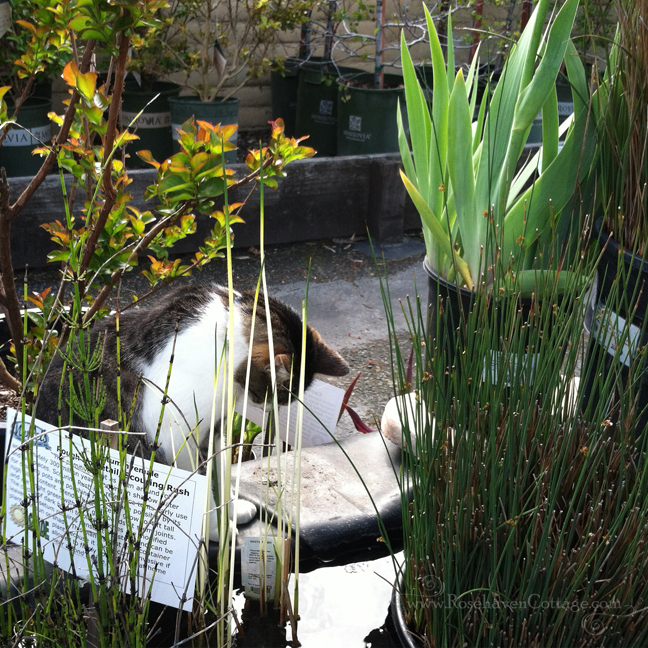 Frankie immediately returned to his jovial hospitable demeanor and continued to follow us around as I picked out plants. I knew I was smitten with Frankie when I found myself trying to come up with reasons for "needing" to go to the nursery. I can't help it. He's just so cute. And he's a kitty! I can't help but be smitten. I was not compensated in goods, services or funds for writing this post. The only "payment" I received were rubs and purrs from Frankie. You and you cat love :) You just have a soft spot for small, fluffy things that purr. I honestly think that most situations are made better and infinitely more enjoyable in the presence of a cat. You know a shopkeeper is a kind person if he/she keeps a shop cat. Frankie is adorable. It's good that the nursery staff have recognized that he is an asset to themselves and to their busines. They could have just as easily chased him off when he started coming around. I love this Frankie post! What a darling boy! I would love to have seen him do his kitty-double take with Chica! 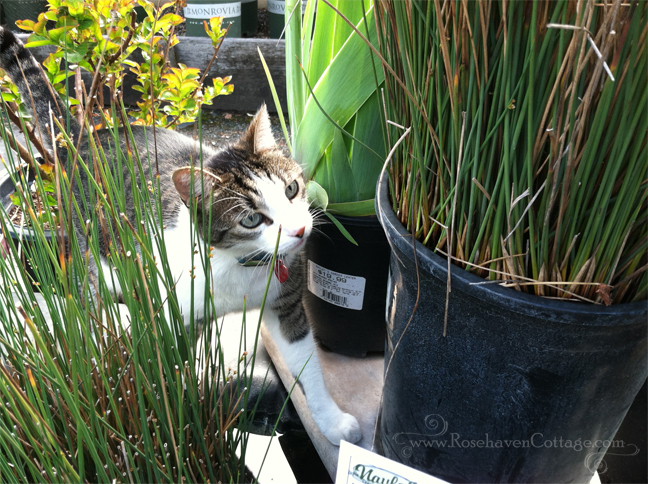 What fun to have a kitty friend AT THE NURSERY! (Is this Navelets associated with the one that used to be in Livermore? Oh my gosh, what a beautiful place to visit, and to have a cat friend there also...I would be there everyday. He is adorable, and what a total cat paradise for him to roam. People when he wants them, and plants and cat distractions in the plants. What a lovely story and such a wonderful cat. I wonder if his owners are aware of his visits to the nursery! Ahhh ... no payment more valuable than approval from Farnkie for your beautiful photos. (and such a very handsome cat, I might add).